Palm has been reborn: Its new owner HP has just revealed a new Palm-designed webOS device. Meet the TouchPad, Palm’s modern-generation tablet PC and the newest challenger to the iPad’s tablet throne. 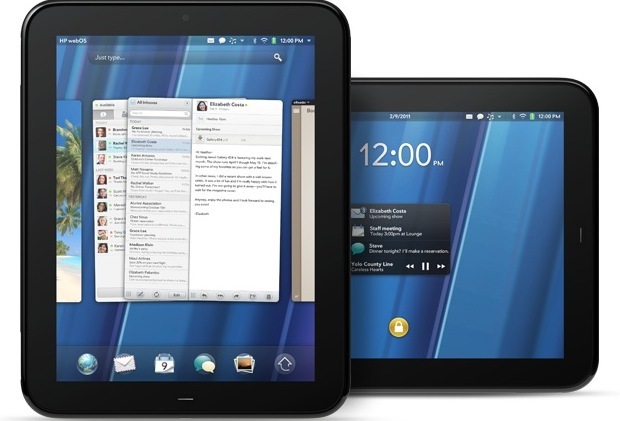 The company also introduced two webOS smartphones. Formerly codenamed Topaz, the HP TouchPad device is 13.7 mm thick, weighs 1.6 pounds, and has a 9.7-inch 1024 by 768-pixel touchscreen (if these specs sound familiar, it’s because the iPad is 13.4 mm thick, and also has a 9.7-inch capacitive multitouch screen with 1024 by 768 pixel resolution). 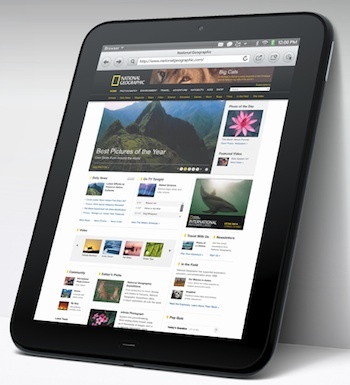 The tablet also has a 1.3 megapixel webcam, supports video calling, a gyroscope, accelerometer, compass, dual core 1.2 GHz processor, and is in Rubinstein’s words, “screaming fast,” adding that “No one comes close to replicating our WebOS experience.” The device allows users to access and edit Microsoft Office docs, supports VPN and multitasking, and more. The TouchPad has all the usual wireless connectivity, internal stereo speakers, comes in 8GB or 16GB options, and has a Wi-Fi-only or 3G-enabled variant–the latter also sports A-GPS. This makes the device sound very similar, specs-wise, to the current iPad. The differences between the devices are centered on the webOS code, of course, plus the TouchPad’s CPU, its microUSB charger port, LED alert light, gyroscope, support for Adobe Flash, and the TouchStone wireless charging protocol. This clever system now also enables touch-to-share technology so that you can punt web addresses of interest between your TouchPad and compatible Palm smartphones just by bumping them together. The TouchPad somewhat eschews Apple’s multiple-layered onscreen keyboard, and its touch-keys also include a row of numbers for easier text entry. There’s a bunch of official accessories, including the TouchStone charger/stand system, an HP-designed case and an “ultraslim wireless keyboard” for easier text entry. The TouchPad’s just one of a few new devices debuted today. The company also rolled out the new Pre3, and HP Veer. Palm CEO Jon Rubinstein called the Pre3 a device for people who want “powerful productivity without giving up their personal passions,” and “a phone you can use for business that you don’t want to leave at work.” It’s got a touchscreen, a full QWERTY keyboard, a gesture area, 3.6-inch 480-by-800 WVGA display, 8 or 16G memory, and more. The Pre3 will be available this summer. The Veer will be available in early spring. Both new phones are Touchstone compatible, and will connect to the TouchPad to do that neat data-sharing trick enabled with the Touchstone wireless circuitry. Pricing for both units is as yet unrevealed. E.B. Boyd contributed to this report.